The NZDUSD has moved higher as up ticks in stocks help the tone in the pair. The pair is moving back toward the close from Friday at 0.6830 area. The high just reached 0.6827. At the low today, the pair tested the 200 hour MA at 0.67928. The low for the day reached 0.6797 today. On Friday, the pair reached 0.68428 after cracking above the 200 hour MA earlier in the day. That high stalled at a topside trend line. The correction down to the 200 hour MA (and hold) keeps the bulls/buyers in control. Going forward, it will take a move below, and then a lower trend line and 100 hour MA (blue line at 0.6787) to weaken the tone. 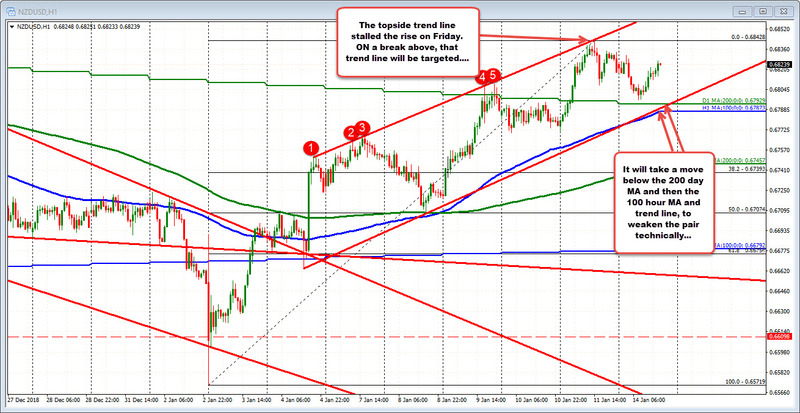 On the topside, a move above the high from Friday will look toward the topside trend line. That trend line extend up to 0.6864 currently (and moving higher).